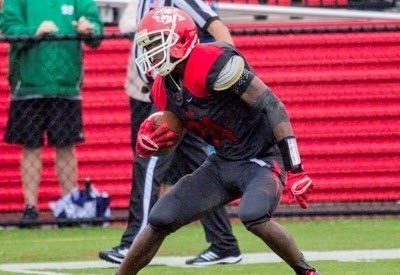 ANNVILLE, Pa. -- Albright College sophomore Gerrod Gainer has been selected as the Middle Atlantic Conference Special Teams Player of the Week the conference office announced on Sunday. Gainer, from Newark, N.J., had an impressive day in the return game for the Lions on Saturday at Widener. Gainer had 191 yards of returns against the Pride, which included six kickoff returns for 168 yards. He averaged 28.0 yards per kickoff return and had a long of 59 yards and he also returned three punts for 23 yards and had a long return of 14 yards. Additionally, he caught five passes for 44 yards and a touchdown and had 242 yards of total offense on the day. Gainer becomes the second Albright player to be selected as a MAC Player of the Week joining Joe Magosin who was chosen as the Defensive Player of the Week following a week one victory over Kean. Albright returns to action on Saturday (Sept. 27) when it hosts Stevenson for Homecoming at 1 p.m. in Shirk Stadium.